1)You trade of six Pokemon you caught/bred over Wonder Trade; and what you get from the trade, you must use in the tournament for a full 6-on-6 battle! List what Pokemon you get because it's not like anybody's going to change their team for an advantage. *Note, there is an honor system in telling what Pokemon you got in the tournament. 2) No evolving them! If you are Wonder Traded a Zigzagoon, you are not allowed to evolve it into a Linoone. It must stay a Zigzagoon. 1. However, you are allowed to teach it TMs/HMs, tutored moves, and EV train it to give Zigzagoon a competitive edge. 3) No retrades! The first six you got are the six you use. Even if you get 4 Scatterbugs in-a-row, you must use those 4 Scatterbugs on your team. This will be a lesson to teach us about Pokemon we might not ever use and how to improvise Pokemon we would most-likely not use in a battle! 7+ participants: Classic single-elimination bracket. List out what you got for a Wonder Trade in this forum, and may the trades ever be in your favor! Im in. as soon as i wondertraded 6 Pokes i'll post it. Okay, I added you to the roster! I had to update a little on the rules because it did not make sense. Having 5 people separate into two groups of round-robin doesn't make sense. I'm definately in, I'll wonder trade and post as soon as I'm done. I will EV train these suckers just as soon as I finish the team I'm working on for the International Competition Tournament, then I'll PM you when I'm ready. Btw is this a singles or doubles tournament? Yes, Don. 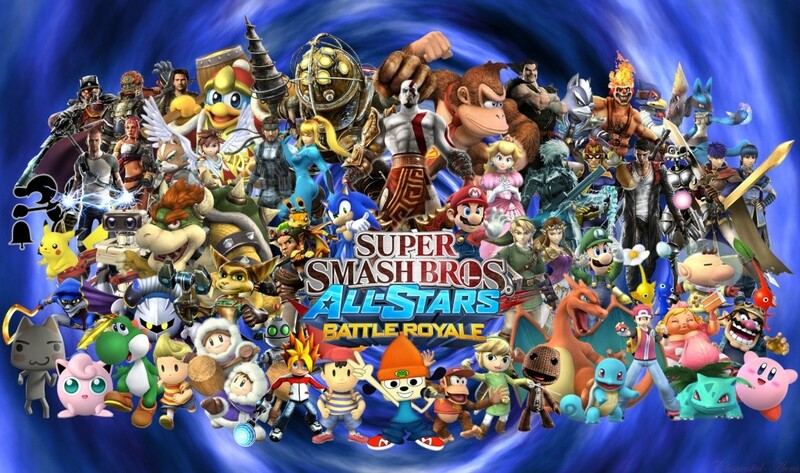 I forgot to mention but, The tournament will be a single battle tournament. So far, we will be doing our tournament in a round-robin format unless we get +7 participants. How about we close the registration to the tournament on Saturday; and we will arrange matches starting Monday? We still have a few active members who might want to join! It's your call, Bud. I think we might want to extend it a little longer since many of the members don't come on as much. I'm game for whenever. I too would give it another week to see if anyone else would like to join. This is shaping up! Sounds like fun in the making. I can give it another week! 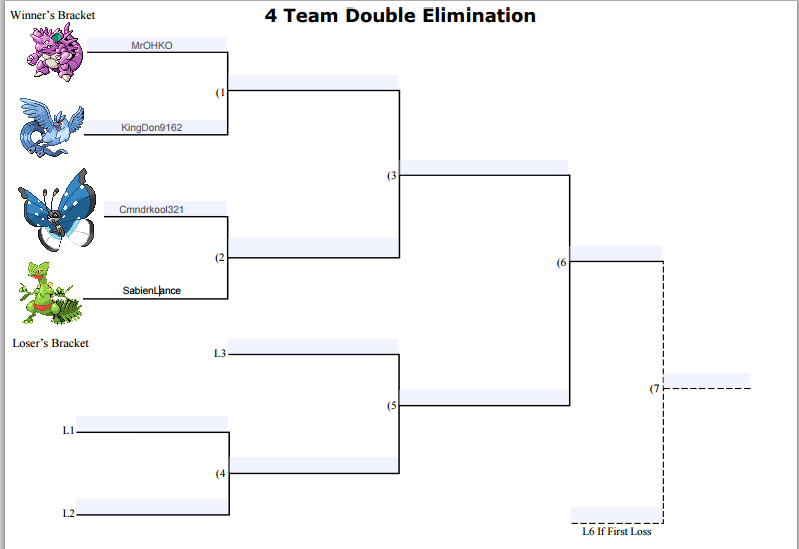 I think I will make the tournament a double elimination tournament if we got 4 people! Round Robin would be hard if we all can't battle within a tiny time frame. I guess so. I will make a bracket sometime this week. I am a bit overwhelmed with a new class in college; but I will definitely get one set up at least by Thursday! Sounds like a plan, Cmndr. Keep me posted. Some egg moves too but I won't say anymore on that hehe. Will try get these puppies potty trained and ready to roll soon. Okay, guys, I will start making the tournament bracket now! I was gonna start it a few days ago, but a little "car accident" set me back a little. I gotta finish some EV training too. MrOHKO got lucky with the Donphan, but can it beat Heracross? lol Just gonna warn you, I got a lot of aces up my sleeve for this tournament! I know this sounds a bit stretched, but let's try to get these battles in by the end of the month because some of us have outside factors and EV training to do! Looking forward to a great battle with you as always my friend. Next weekend is best for me as I am off Sat and Sun. If not I'm available weekdays but I work from 3:30pm until 11:30 pm EST. Just let me know and we'll set something up. Good luck to everyone in the tournament, it'll be a blast! great I have some training to do also but can't wait cmndr.